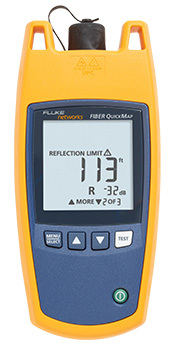 Fiber OneShot™ PRO and Fiber QuickMap™ measure length and identify high loss events on single mode (Fiber OneShot PRO) and Multimode (Fiber QuickMap) fiber optic cable. Like an OTDR, a laser sends light pulses through the fiber and measures the power and timing of light reflected from high loss connections and splices, and the end of the fiber. In about 5-6 seconds the unit displays loss and distance of the first incident detected. Additional incidents can be seen by pressing the up or down buttons. The unit automatically checks to make sure the fiber is not active before allowing the test to begin. VFLs work well for exposed lengths of fiber near a patch panel by illuminating bad connections and breaks. They are not very helpful for cable runs more than a few meters, or when the cable is not visible or accessible, or when the laser light can’t penetrate the jacket. Optical Time Domain Reflectometers (OTDR) provide graphical data and analysis along the entire length of a cable, way beyond the reach of a VFL, but they can be expensive and require more time and skill to operate. Fiber OneShot™ PRO and Fiber QuickMap fill the gap between a VFL and an OTDR. These models have the simplicity of a VFL, and provide distance and power information on high losses, breaks, and the end of the fiber. They also identify live fiber. Fiber OneShot PRO provides immediate and in-depth visibility into a singlemode fiber cable (below). 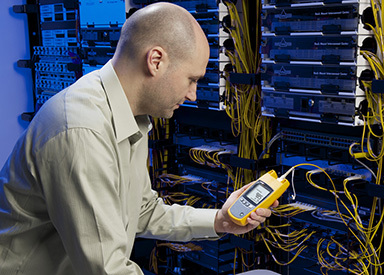 Fiber QuickMap operates the same, except on multimode fiber up to 1,500 meters / 4,921 feet. The result loss of the fiber (RL) is 2.6 dB. The receive fiber adds 130 m to the length measurment. The end of the link. The length of the link (without the launch fiber) is 8463 m.
A bad splice on the fiber at 2450 m caused a reflectance incident that is larger than -45 dB (the default limit). The reflectance of the first connection is -52 dB. The length of the launch fiber is 130 m.
Incident 0 is the connection to the troubleshooter. Screw on interchangeable SC adapter. Older models have rectangular latching style adapter. Live fiber detection Detects optical signals from 1250nm to 1625nm and shows ACTIVE LINE if a signal is there. Looks for a signal every 3 seconds after the first detection. +7dB maximum input power. Live fiber detection Detects optical signals from 600 nm to 1050nm and shows ACTIVE LINE if a signal is there. Looks for a signal every 3 seconds after the first detection. +7dB maximum input power. Bulkhead quality If no fiber is attached or if the connector is dirty, the troubleshooter displays 0m or 0ft. 1a. Detects the location of an incident that has a reflectance larger than -62dB. 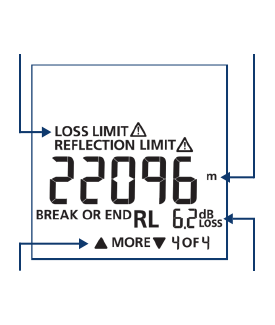 Detects incidents ›2m after the bulkhead connector when the bulkhead reflectance is ‹35dB. Detects incidents ›3m after an incident when the incident reflectance is ‹35dB. 1b. Finds and gives the location of an incident that has a reflectance larger than -55dB. Detects incidents ›1m after the bulkhead connector when the bulkhead reflectance is 3 m after an incident when the incident reflectance is. 3. With a backscatter coefficient of -63dB at 850nm using a calibrated -14dB reference. 4. ± user-configurable Index of Refraction (IOR) error ± the incident location error. FOS-S Fiber OneShot™ PRO. 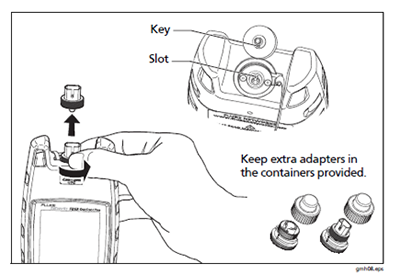 Includes single mode fiber fault locator unit, screw on interchangeable SC adapter, 4-language Quick Reference Guide (manuals in 9 languages available on-line), safety instruction manual, and batteries. FOS-100-S Fiber OneShot™ PRO-Kit. Includes single mode fiber fault locator unit, screw on interchangeable SC adapter, UPC-UPC 2-meter patch cord, carrying case, 4-language Quick Reference Guide (manuals in 9 languages available on-line), safety instruction manual, and batteries. FOS-100-S-VFL Fiber OneShot™ PRO-Kit with VisiFault. 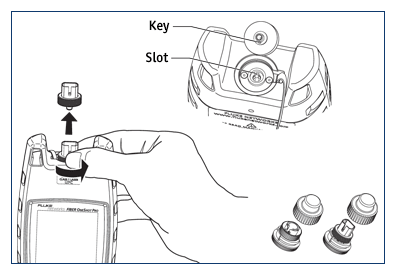 Includes all the items in the FOS-100-S plus the VisiFault Visual Fault Locator with 2.5 mm universal adapter. FOS-SFP-PM Fiber OneShot™ PRO-SC-Kit with SimpliFiber Pro— Includes all the items in the FOS-100-S plus SimpliFiber Pro optical power meter and SC adapter. FQM-M Fiber QuickMap™. Includes multimode fiber fault locator unit, screw on interchangeable SC adapter, 4-language Quick Reference Guide (manuals in 9 languages available on-line), safety instruction manual, and batteries. FQM-100-M Fiber QuickMap™ Kit. Includes multimode fiber fault locator unit, screw on interchangeable SC adapter, UPC-UPC 2-meter patch cord, carrying case, 4-language Quick Reference Guide (manuals in 9 languages available on-line), safety instruction manual, and batteries. FQM-100-M-VFL Fiber QuickMap™ Kit with VisiFault. Includes all the items in the FQM-100-M plus the VisiFault Visual Fault Locator with 2.5 mm universal adapter. FQM-SFP-M Fiber QuickMap™ Kit with SimpliFiber Pro— Includes all the items in the FOS-100-M plus SimpliFiber Pro optical power meter and SC adapter. LC Adapter for older meters with a rectangular optical port. Use SMC-9-SCLC SC launch cable.